Hello there! Are you ready for another lovely sketch from Pals Paper Arts Resident Artist, Margaret Moody? This week's PPA Challenge is a sketch challenge! To participate, just create a project, including the 5 sketch elements. Then link up your creation to the Pals Paper Arts blog when the challenge goes live this Thursday, April 18! Don't you just love new paper? This great new DSP is from the This and That product line. The Epic Day DSP has great new prints and can be used on anything. It is very trendy! 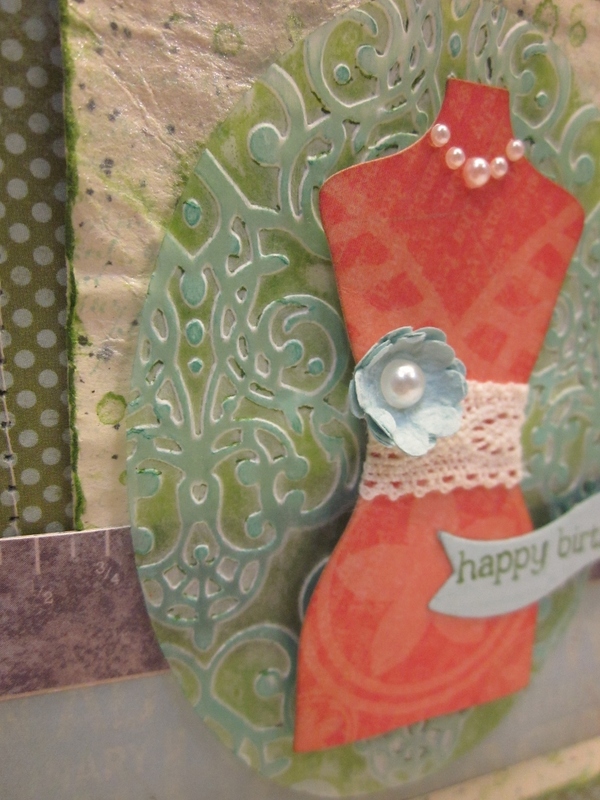 Four different papers were used on this card, but all from the same pack, very versatile. The new Dress Up framelits can be placed anywhere on your paper for the best look, I thought this part of the paper would look perfect. I snipped off the stand, added some ribbon, flowers, and pearls and done. Do you spy the oval background? I pulled out my bags from the halloween bundle, die cut the oval with the oval framelits, embossed with the lacy brocade embossing folder, then I brayered on pool party ink on one side, let it dry, flipped it over and brayered on gumball green on the other side. A beautiful two tone look! The background under that is a piece of naturals ivory card stock, stamped with the french foliage stamp set, distressed and spritzed with vanilla shimmer smootz spritz. Vintage all the way! 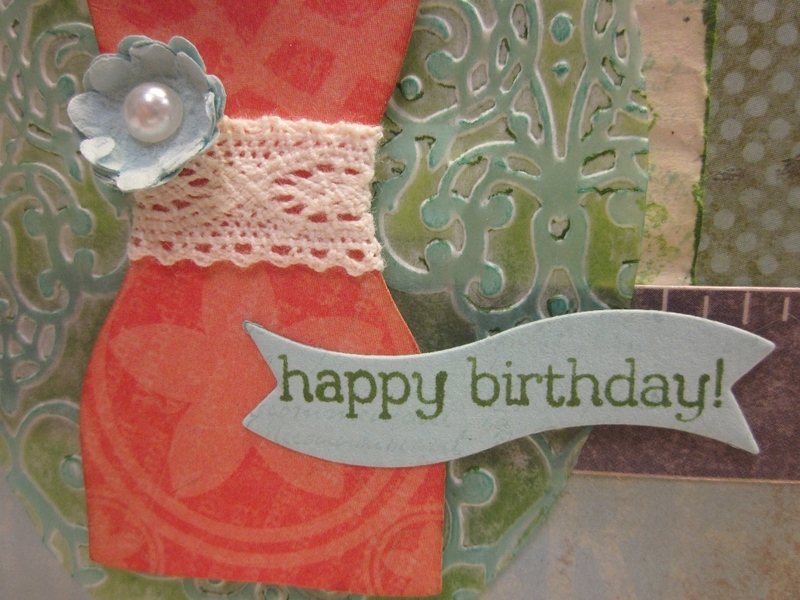 This sentiment is also from the All Dressed Up stamp set, I only wanted the sentiment, so I colored just the happy birthday with my gumball green marker, die cut it with the bitty banners framelits. This would make a perfect scarf, but I had already added the pearls, so I found another place for it. Thanks so much for stopping by today, I really hope you were inspired, enjoy! 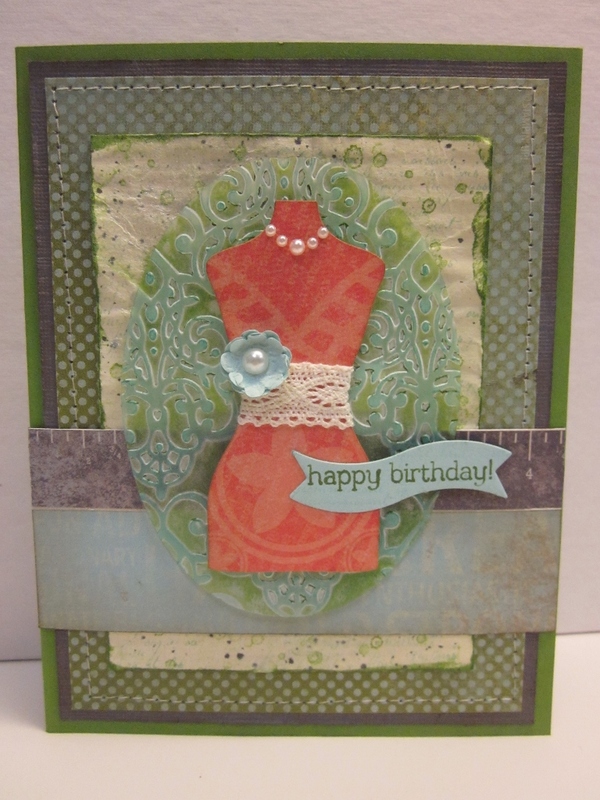 love how you did different colors on each side of the embossed oval. genius! Very pretty, Sandie! 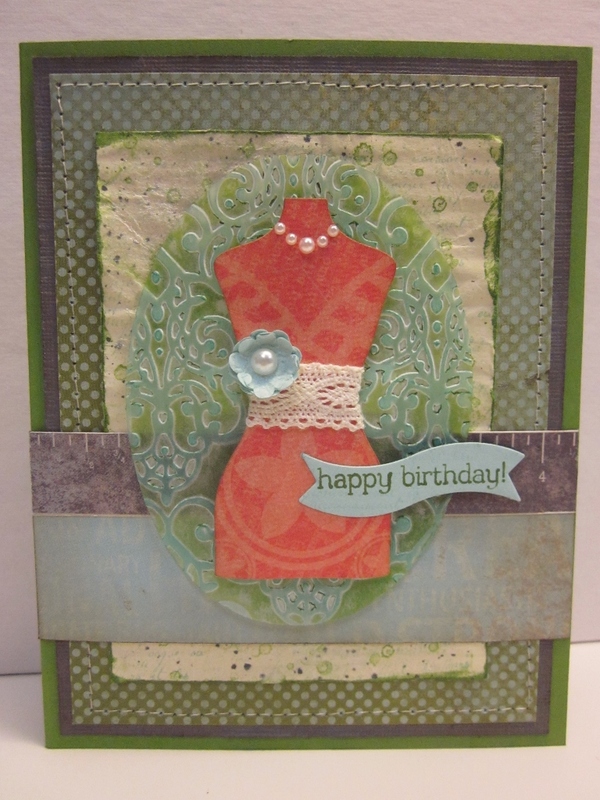 I love how you used the Epic Day papers on your card, that coral dress really pops on them! Dressed for success! I love this look. Your blog looks great ,too!! 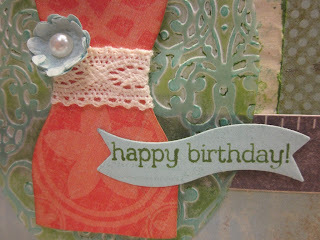 Beautiful card, loving all the textures and expecially that great oval. Great birthday card, Sandie! Love the lace and pearls! All dressed up is right! Beautiful! Absolutely gorgeous, Sandie! I love the pearls! Pretty, pretty!! I love horizontal sentiment in the wavy banner- such a neat look. The whole design is great! So pretty with all those lovely details!